Summary: Back in the day, various programs gave awards for good web pages. We were happy to receive the ones below. Only one is current era. BHSI's Randy Swart was awarded the ASTM Award of Merit in 2014. The citation read in part: "Your extensive knowledge and commitment to excellence in standards development have had a major impact in your field and have made ASTM International a technical leader in today's global business world." 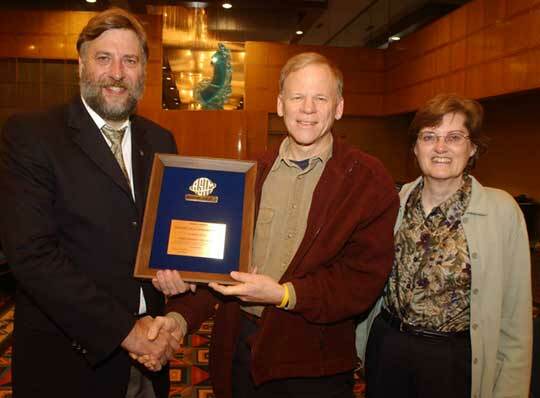 BHSI's Randy Swart was awarded the William F. Hulse Memorial Award in November, 2006 for his work on ASTM's F8.53 helmet standards committee. From left: F8 Committee Chairman Martyn Shorten, Randy and his wife, Barbara Swart. There is more about the award on the ASTM site. We're pleased to be picked as a Selected Site by Eye on the Web! And we were delighted to receive the NetMom Slice o' Pie! from the Tennessee Fire Prevention Association.